Sweep picking is a technique used by many players including Joe Satriani, Steve Vai, Paul Gilbert, Yngwie Malmsteen, Jason Becker and Marty Friedman among many others. Today you will learn a basic sweep picking example along with two riffs as played by Steve Vai and Joe Satriani, so let's jump right in! Sweep picking is a technique used by taking a one-note-per-string arpeggio and playing it using all down strokes when ascending, and all up strokes when descending, so as to create a flowing downward/upward motion over the entire riff with your picking hand, rather than a constant down-up-down-up motion that is far less efficient in this circumstance. The effect of sweeping the strings/notes is to greatly increase the speed at which one can play a given riff. let’s take a look at the tablature example below, it’s a simple pattern to remember although it sounds terrible, and is merely being used as an easy introduction to sweep picking. Starting off on the fourth string twelfth fret with a down pick, simply play the next three notes with the same down pick in one motion. Now we start our descent starting on the first string twelfth fret and play the next three notes with the same up pick. This pattern is great for building sweep coordination. Take a look at the video where I will show you a slow version. 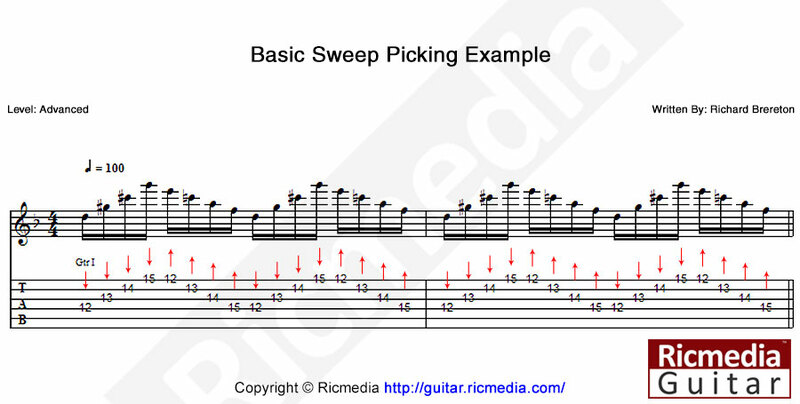 Again this pattern is not meant to sound good, it’s just an introduction to sweep picking. Once you have this pattern at about 100bpm with no mistakes, it’s time to move onto the two riff examples below. Now onto riff B which is an adapted sweep from the Joe Satriani song "Mystical Potato Head Groove Thing" from the album "Flying In a Blue Dream". Joe does his one handed legato technique on this riff but seen as though it's a one note per string line, we can adapt it to sweeping very easily. Using all down picks, start on the twelfth fret sixth string, then fifth string fourteenth fret, then fourth string sixteenth fret making sure you use your fourth finger for this note. Now we play the third string twelfth fret with your first finger, then second string fifteenth fret and finally the first string seventeenth fret using your fourth finger. We simply reverse the pattern for our descent but make sure you also switch to up strokes. Take a look at the video for a slow and fast version of this riff. I will be introducing some more sweep picking riffs soon but these two should keep you busy for a while, just take it slow and gradually build up speed. 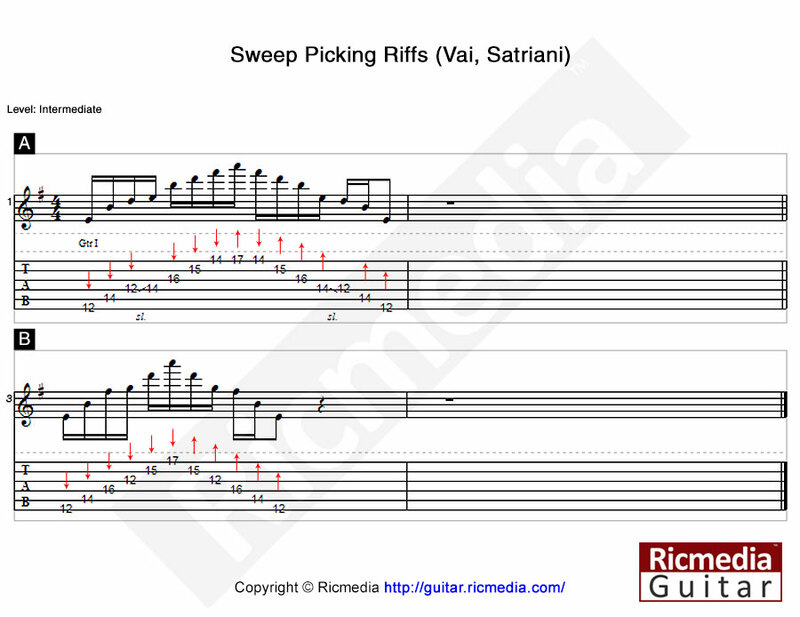 Why not make your own sweep picking riff from the arpeggio section. Well that’s another lesson over and I hope you gained something from it. I am really not much of a sweep picker as there is not much call for it in the blues genre 🙂 Remember, keep practicing and have patience.